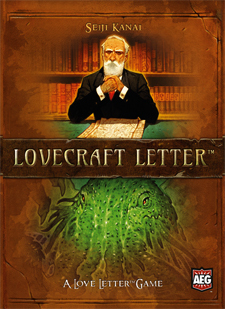 Lovecraft Letter is a game of risk, deduction and luck that uses the award-winning Love Letter engine. 2 to 6 players embark on a quest to find a relative of theirs. But there are many obstacles, none of which more daunting than the insanity contained in some of the clues left behind. Will you achieve your quest, or fall into insanity in the process?